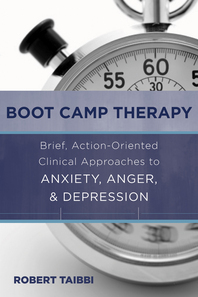 Boot Camp Therapy - Description | W. W. Norton & Company Ltd. In some cases long-term therapy that seeks to assess a client’s history and gain insight over the course of many sessions isn’t always possible. Immediate behavior change and concrete steps to fix the problem at hand are sometimes more practical and desirable. Grounded in a results-oriented brief therapy model, this user-friendly guide presents the author’s “boot camp” approach—focusing on a client’s immediate behavior, helping them to do things differently, take action, concentrate on process, and use targeted goals and homework to jump-start and motivate them into taking risks and breaking patterns. Following this approach, Taibbi walks readers through session-by-session treatment “maps” for achieving solutions to three of the most common issues in therapy.